Interlude works will be on view until January 16th. The BAU Institute exhibition will be on view until February 17th. Gallery Hours: Thursday - Sunday, 1 - 6pm or by appointment. Join us for the opening of new Interlude cycle & SpaceProgram exhibit of BAU Institute resident artists. Join us for the opening of new Interlude exhibitions, with work by Amy Lowey, Jack Adams, and Jessica Simms, as well as the unveiling of a new SpaceProgram short-term exhibition of work by fellows of the BAU Institute from their 2015 Residency in Cassis, France, hosted by the Camargo Foundation. The Interlude Project presents rotating exhibitions on a 500ft-long construction wall on St. Johns Place, next door to FiveMyles, for the duration of the construction of a large rental building. 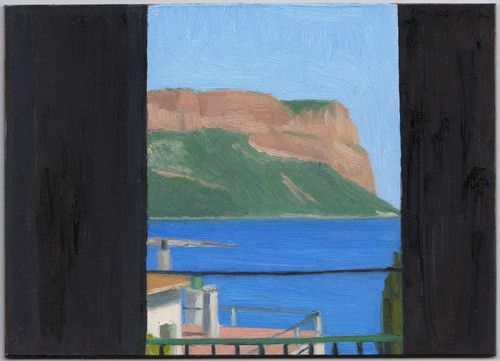 In 2014 BAU Institute launched a new arts residency hosted by the Camargo Foundation in Cassis, France. The Residency provides BAU Institute funded Fellowships for the realization of projects in the arts. There is no cost to attend. Creative practitioners demonstrating a serious commitment to their practice and a desire to work independently within an international community are welcome to apply. The mission of the BAU Institute is to support artists, writers, and other creative professionals by providing uninterrupted time and space for the creation of new work in settings of cultural interest and natural beauty.